On the first glance gadgets and extreme sports don't have too many things in common. And yet, consumer-friendly tech has always found a way to make our lives faster, easier and more streamlined. Enter off-road electric skateboards, a perfect match for all the people who want to bring their skating skills out of the streets and into the fields. Easy to learn and hard to master, they allow all the skating aficionados to enjoy nature and focus on technique rather than pushing the board. But which one to buy? Let’s take a look at some of the best off road electric skateboards to see which one deserves your money the most. 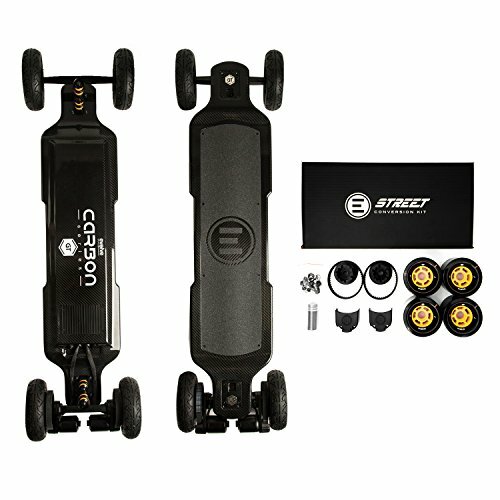 In the table below, we included three off-road electric mountain boards which we would recommend to our friends and family based on their budget, as well as skateboarding expertise. Let's start with the in-depth reviews of each product. With its strong set of features and excellent build quality, this skateboard easily leaves the competition behind. Evolve Skateboards is a company that’s been around for only a couple of years but still managed to make quite a splash in that short span. Later on in the review we will check out the Bamboo GT, but it's no contender to the Carbon. Put them next to each other and you won't need more than a passing look to see which one of them is a flagship product. Unfortunately, that also means that Carbon GT retains one of Bamboo’s biggest issues – the price. If Bamboo GT was out of your budget, you should skip Carbon GT altogether. However, if you are ready to pay for the premium product, you will find a board that easily eats through any kind of terrain. Even more important Carbon is fast, durable, mean and incredibly fun to ride. There’s a cool customization option too. You can switch your all-terrain wheels for the street alternative. A beautiful carbon deck is rock-solid and won’t get damaged even after a couple of harder crashes. With its length of 102cm and weight of only 7.9kg Carbon GT makes one very compact and lightweight unit. The speed is also very good. Depending on the terrain you will be able to breeze at up to 42km/h in a range of stunning 20 km. This allows you great freedom to use the board for whatever purpose you want. It is also good to know that, much like Bamboo GT, Carbon GT can also climb the slopes of 25 degrees. Charging time is very solid. If you buy an optional fast charger, powering up the unit to 100% won't take you more than three hours (regular charger does the job somewhere between four and five hours). One of Carbon GT’s more unique features is the very way the unit controls. Pulling the speed trigger back won't cause the unit to go reverse, but engage the breaks and slow the unit to a halt. This control scheme needs some adjustment but produces a very smooth experience once you get used to it. The controller also features a bright LCD display that gives you detailed real-time feedback on all of the board's vital parameters. A champion in the entry-level market skateboard, featuring a price tag less than half of the regular boards. MotoTec may not be as big of a name in the world of electric boards as Evolve Skateboards, but in spite of that, 1600W still makes one very strong outing. As a matter of fact, in some areas, the unit even rises above the competition. Sure, the design may be uninspiring, but this unit is a dirt-board and doesn't hide the fact it was built to play rough. Keeping that in mind, the utilitarian look doesn't take too much away from the overall impression. The build quality is very solid, and the unit feels like it can take a lot of abuse, which can’t be said about the remote which is, once again, very poor. As for the performance, the board controls and makes brakes extremely well (dual motor setup does an excellent job eliminating twisting), with the slight exception of pretty substantial turn radius. The bigger issue, though, is the inconsistent battery that slows down the unit once you pass 50% of juice. If not for its weight it would be easy to say 1600 W is a compact unit. However, the 35 kilos are simply too much to bear, so be sure to charge to board before you go anywhere. The maximum speed clocks at 35 km/h and the maximum range is 16 km (both are weight dependent). Not too shabby, but not all too impressive either. The two-motor setup (1600 W total) makes the unit feel extremely powerful, so it can easily carry up to 100 kg of weight. When it comes to the features, 1600 W feels uninspired and to be quite honest, there is only so much you can do with this type of controller. The only thing you can do to customize the riding experience is to switch between faster and slower, but more power economic riding mode. A great option, and reasonably priced. Amazing user reviews. Evolve Skateboards' second entry on our list is a more affordable version of the GT Carbon listed at no.1 in our review. Their latest iteration of the Bamboo series does a solid job at keeping up with the brand's reputation, but, unfortunately, has some drawbacks as well. For a start, the remote feels very cheap and makes a poor couple with an excellent bamboo deck mounted with four even better wheels. Also, the unit feels a bit too pricey for what it has to offer. However, if you are willing to look past these flaws, you will find a well-built piece of equipment that controls very well (with the exception of breaking that feels too delayed and erratic) and offers a couple of interesting riding modes. The unit can easily traverse pavement, short grass, and dirt so you won't have any problem taking it to woods. Still, nothing we’ve not already seen from this manufacturer. For a start, Bamboo GT offers rock-solid 19km of range. If you are running the board in some of the power-saving modes (see more below) you will be able to easily pass the greater distances. The unit can run at the speed of 40km/h, climb at the gradient up to 25 percent and weighs approximately 9kg. However, the ergonomic rubber body over-mould compensates for this slight problem and makes the board easier to carry. Although the poor remote doesn’t offer too much space for you to play with (it shows only the bare bones information about the boards status, speed, and battery), Bamboo GT does offer four different speed modes – GT, Fast, Eco, and Slow. If you are using the board to commute around the city and switch to some of the economic modes, you can basically leave your charger home. Alternatively, switching to GT will allow you to tackle some slopes that are out of question for street boards. Airwheel M3 is a board that could easily go unnoticed in the crowd if not for one important feature – the unit comes to you unassembled. If you have any deck you would rather see on top of this setup, you can easily use it instead. That, however, would be a horrible waste, since the hand-made maple feels strong and looks suited for riders of all ages. The wheels aren’t bad, either. Although they are designed primarily for concrete, they can traverse all kinds of terrains and deal with annoying sidewalks, so you shouldn’t be afraid to take it to short off-road detours. The controls work well, so riding the board feels truly effortless. The main issue here is the slow speed that somehow produces strong momentum during acceleration. So, the board basically catapults you forward and then keeps you at low speeds that can’t be used for anything but casual skating and commuting. As we already mentioned, except for its modular design, Airwheel M3 fits pretty well in the rest of the crowd. It has a range of 16km and weighs reasonable 11kg. Unfortunately, the speed you can achieve goes only up to 19km/h, so you shouldn't rely too heavily on the board to get your from point A to point B if you are in a hurry. It is also good to know that the motor is powerful enough to push you up the slopes that angle at about 15 degrees which drastically improves the usability of the unit. Besides the standard remote which allows you to operate the board and gives you only essential feedback, Airwheel M3 also features a smartphone app that provides you much more detailed info about its status. With a simple name and even simpler design, Wave Street looks like one of those countless no-name products that were slapped together to cash in on whatever may be a hot sell at the moment. That, however, doesn’t have to mean that the products that graced the market this way don’t offer some value. As a matter of fact, some of them feature a killer price/value ratio. Wave Street Off-Road Skateboard might just be one of these products. For a start, in spite of looking awfully uninspired, the unit is very well put together and handles rather well. Also, the 2000W engine may not be as powerful as the one we saw at Evolve’s Carbon GT but it certainly rises above the average. Finally, the price is low enough to spark a strong internet amongst the buyers who are looking for a high-quality budget option. Bet let’s take a look at specs to see how much value is truly there. With the weight of 13.5 kilograms, Wave Street Off-Road Skateboard doesn't necessarily fall amongst the units you would like to carry around when the battery runs dry. Unfortunately, the units range clocks at around 16km, which is not that bad but can certainly be improved with the next iterations. The good news is that powerful motor allows the board to carry as much as 130 kilograms of weight and breeze at the top speed of 30km/h, so you will at least be able to carry some baggage while you’re traveling. Also, the unit can climb the inclines of 30 degrees which is pretty impressive. This skateboard may not pack too many advanced features, but the core specs certainly keep the product on the radar. The deck is made of durable Canadian maple and the package comes with a set of pretty sweet pneumatic tires that can survive a lot of abuse. Also, it is worth mentioning that the unit supports a fast-charge option so you will be able to charge the board from 0-100% in no more than three hours. Maverix USA Border X is a product that is pretty much in the same vein as MotoTec’s 1600W. Essentially, it's a cross between an electric skateboard and dirt bike, which should give you a pretty good idea of what you can expect – a powerful motor, heavy weight, and durable build. Such setup also means this is one of the rare units that can deal even with the toughest mountain tracks which is always a plus. So what have good people from Maverix done to make their product stand out from the competition? Well, the deck and tires feel very durable, and if you ever wanted to have a monster truck version of an electric board, the design will certainly put a smile on your face. As for the downsides, the battery life is very poor and although the unit was built for exploration, you won’t get a chance to do much. A by-the-numbers product if ever there was one. As you would expect a powerful 800W motor takes quite a heavy toll on the unit’s weight. Although slightly lighter than MotoTec’s outing, USA Border X still weighs overwhelming 32 kilometers. This time, though, you get only one motor. The speed of 30km/h is solid and doesn’t stand out from the rest of the products we can find in this niche. It is such a shame then to see the battery allows you to traverse only 14 kilometers in one charge. Having more juice would drastically help this product to get an easy selling feature. Maverix USA Border X offers a pretty standard set of features for a dirt board, meaning you won't get too many options to play with. The package contains a pretty shabby gun-like controller that allows you to switch between three-speed settings and optimize the consumption. On the other hand, the implementation of the ABS braking system is a truly praiseworthy move that will make your riding so much easier. Is an electric skateboard good choice for a first-time rider? When it comes to electric skateboards having a previous skating experience is certainly welcome so you could buy yourself a regular alternative to cut some basic skills like maintaining the balance. Furthermore, electric skateboards tend to be quite expensive. It is strongly recommended to try out the whole skating gist before you invest a lot of money into gadget you may rarely use. It really depends on the unit, but the list of manufacturers that have produced waterproof skateboards is pretty short and none of them are capable of going off-road, so the answer is as good as no. However, riding a skate on a mountain track while it’s pouring from the sky can only get you stuck in a pile of mud so you’re not really missing anything special. What’s the difference between regular and off-road electric skateboard? Off-road or all-terrain skateboards are usually built with more power and durability in mind. However, the main difference lies in the wheels. In order to traverse difficult terrains like grass, dirt and gravel off-road wheels need to be bigger and hopefully feature pneumatic tires. The good news is that some units like Evolve Skateboards Carbon GT have an interchangeable set of wheels so you can get the best of both worlds. Is it legal to take your electric skateboard to the road? The legislation covering this issue varies from state to state and from country to country. However, in most cases, you are allowed to take your skate on the road as long as you abide by the speed limit. For instance, the speed limit for electric skateboards in the state of California is 56km/h (35mph). If you want to record yourself on your new off road e-skateboard, remember that one hand is reserved for using the throttle remote, so taking selfies might be a challenge, especially when going off-road. We would recommend you get a go-pro, or a drone that can follow you around! Check out our sister site, which reviews some solid drones for less than 500 dollars. Can I rely on the smartphone app for applying the controls? The simplest answer would be – only in the cases of absolute necessity when the remote stops working. This is especially important when it comes to critical controls like engaging breaks. Smartphone apps can easily crash or slow down so they are not nearly as reliable as dedicated remote controls. We hope you enjoyed this roundup of the best all-terrain electric skateboards you can currently find on the market. Tell us what you think, share the post with your friends on Facebook and tell us about your off-road skating ventures. 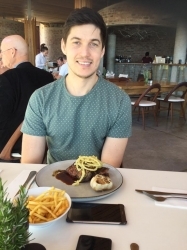 Ruaan is an electrical engineer born in South Africa and currently working in Oslo, Norway. He loves tech and gadgets and owns an electric car (Tesla) as well a front-wheel-drive electric bike. He rides his bike all year, even through snow and ice covered roads in the cold winter.